The 71’ Jim Smith “Fish On” is a custom sportfish yacht that seamlessly blends intricate beauty and design with power – a well-established standard of Jim Smith Tournament Boats. As a young man, Jim Smith’s interest led him to discover a number of passions including barnstorming biplanes, motorcycle racing, and eventually outboard race boats. After twenty years of building and racing hydroplanes, Smith moved to South Florida following his retirement in 1949. There he spent his time deep-sea fishing while observing and admiring the local sportfishing boats. Using his knowledge of boat racing and airplanes, he decided to build his own pedigree vessel – one that combines speed with efficiency and beauty. Continuing that tradition today, the 71’ Jim Smith “Fish On” is a custom sportfish yacht possessing the class, performance, and speed that we’ve come to expect from Jim Smith. Its cutting-edge technology and electronics, as well as its elaborate attention to craftsmanship and design, set this yacht apart from the competition. Whether running through the open ocean towards a destination or relaxing at the port during sunset, this yacht is truly the ultimate vessel. The “Fish On” wouldn’t encompass the Jim Smith nature if it was not fast. Powering this yacht are twin MTUs,12-2000 M94 Common Rail producing 1800 horsepower each. These engines can quickly get this yacht to a cruising speed of 32 Knots at 1850 RPM and a top speed of 40 knots. Expect this sportfish to power you through any conditions to quickly reach your long-distance destination. Just as importantly, the vessel is outfitted for the utmost fishing abilities and billfish excursions. 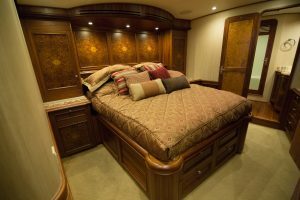 Inside the “Fish On,” you’ll be met with the luxury and sophistication that sets this yacht apart from others. The master stateroom and master head are a carefully crafted work of art boasting rubbed satin varnished teak with Japanese marble wood inlay and exotic marble surfaces. Ample closet space and storage, natural prism lighting and a 30” Sony TV and surround sound system compliment the “Fish On” splendidly. The master stateroom has a full head and gorgeous shower with everything you’d need in a lavish private head. For your guests, there are bountiful options and luxuries to enhance their time at sea. The VIP stateroom has side-by-side single bunks that can be modified into a queen berth and another pullman berth for extra guests. Accompanying the VIP stateroom is a private full head and shower styled with as much detail as you’d expect from a pedigree builder like Jim Smith. 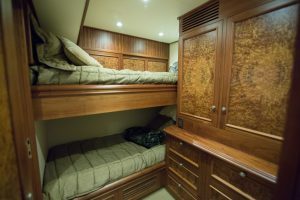 The guest stateroom has Hi-Lo bunks and plenty of storage. The guest stateroom also doubles as a crew quarters as the room features all of the ships monitoring devices and a 20” HD Sharp flat screen TV. Another guest stateroom features a single fixed berth and pullman for extra space and storage if needed. The dazzling amenities exemplify the excellent craftsmanship that illuminates from the 71’ Jim Smith “Fish On.” The salon, galley, and extra-large dinette come well stocked and fully furnished. The salon features a beautiful Corinthian L-shaped leather sofa and a custom teak hi/lo cocktail table for dining and serving drinks. A full entertainment center with a pop-up 50” Sony television is sure to keep everyone entertained and enjoying the beautiful space. The sizable dinette features an impressive teak table and a leather sofa for seating. The galley contains top of the line appliances including a dishwasher, convection oven, Miele custom cooktop, and ice maker. The counter space is generous enough to double as a bar with two custom teak bar stools. Most importantly, the area has plentiful storage with under-counter refrigeration and freezer space, an oversized pantry, and custom storage for pots and pans. 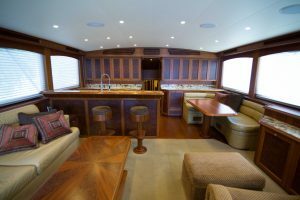 The galley has beautifully crafted real teak, satin finished, hardwood floors. To stay connected, onboard is a KVH V3 satellite system that provides internet and phone connection, as well as Directv service. At its heart, this is a sportfishing yacht equipped with only the best fishing gear and accessories onboard. 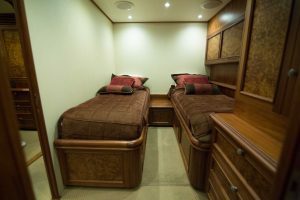 Many of the staterooms feature custom rod and reel storage behind the berths. A massive tackle room is set up to store large 80 and 130-pound rods and reels. The cockpit features a transom box, in-deck fish box, custom livewell systems with tuna tubes, and a custom bait freezer with custom bait trays. 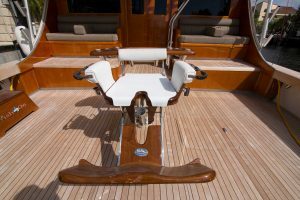 The envy of any sports fisherman, the full-size Bluewater Marlin Unlimited Chair with a 7-rod rocket launcher and drawer is the centerpiece of the cockpit. The Captain of this distinct vessel deserves only the best technology and amenities when at the helm and entertaining guests. The flybridge boasts dual helm chairs and bow thrusters as well as Seastar power steering, making getting around on the open water a breeze. For the captain’s guests, there’s seating made for ten around a custom table and light tackle storage accessible at a minute’s notice. The flybridge also features a custom sound system by JL Audio to get those tunes cranking. The electronics aboard make this yacht genuinely outstanding for traveling safely and securely. The long list of advanced technology includes a Garmin 7215 touchscreen, sonar sounding machine, Simrad autopilot, 3 KEP monitoring screens, Furuno NavNet 3D system, Furuno digital depth finder, Furuno 96 mile radar, 2 VHF radios, and a FLIR system. The Palm Beach Towers Tuna Tower comes with a custom satin finish and features a NavNet repeater, autopilot, VHF, and bow thruster controls. 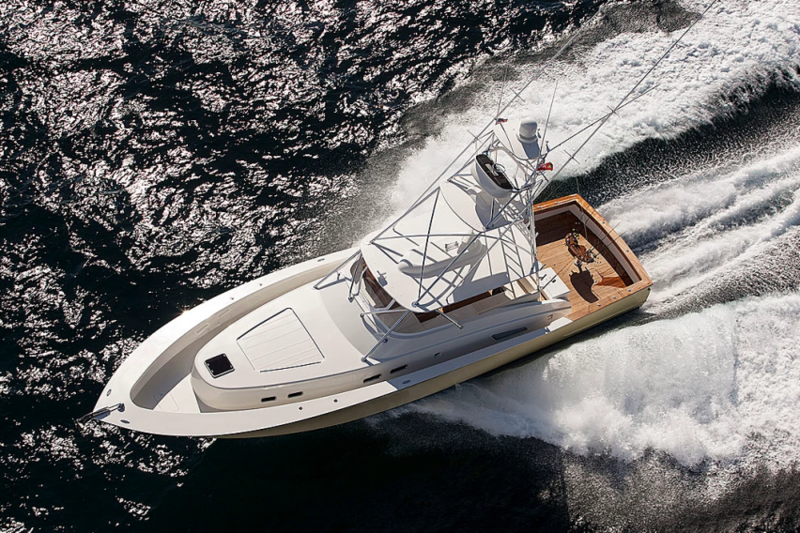 The 71′ Jim Smith “Fish On” is definitively a custom sportfishing yacht with the agility and attitude to match its outstanding luxury, class, and attention to detail. 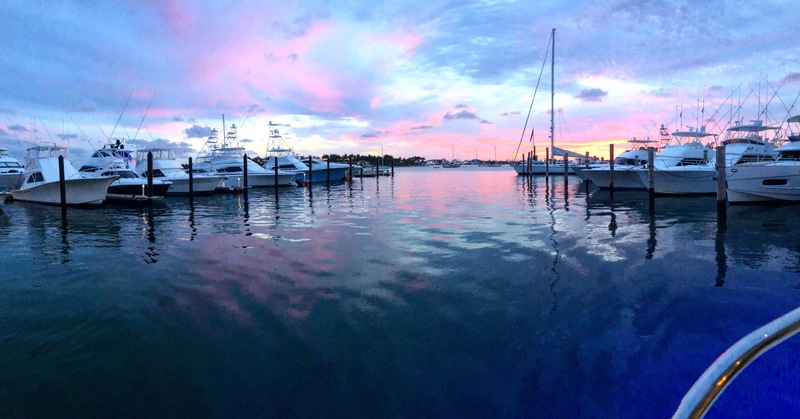 As a brokerage with over 20 years of experience, our team of yachting experts is here to help you find the luxury yacht of your dreams. For more information about the 71’ Jim Smith “Fish On” or any other of our sport fishing yachts for sale call us today at (561) 799-6511 or contact us by clicking here!